The Census Bureau will be releasing new data on poverty this week and no one is expecting much by the way of good news. While the country made considerable progress in reducing the poverty rate in the sixties and seventies, there has been little show for the last three decades. The downturn has reversed any progress that we made over this period. However this is not the story everywhere. Other wealthy countries have considerably lower poverty rates than the United States. There are a variety of factors that affect poverty rates but one that stands out is the power of unions. 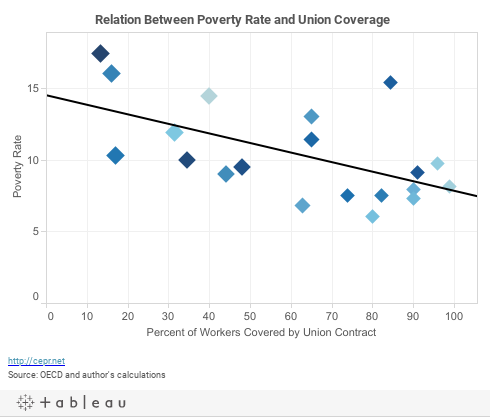 There is a very strong inverse relationship between the percentage of workers who are covered by a union contract and the poverty rate as measured by the OECD. A simple regression shows that a 10 percentage point increase in the percentage of workers covered by a union contract is associated with a 0.7 percentage point drop in the poverty rate. (This result is significant at a 1.0 percent level.) This means that countries like Sweden, Belgium, and France, where the coverage rate is close to 90 percent, can be expected to have poverty rates that are more than 5.0 percentages points lower than in the United States, where the coverage rate is less than 15 percent. In the case of the United States this would imply a reduction in the poverty rate of almost a third from current levels. Of course it would be overly simplistic to imply that an increase in unionization rates by itself would lower poverty. There are many other differences in the countries where large shares of the workforce are covered by union contracts. These countries all have paid parental leave for parents of small children. They also have much better provision of child care than the United States. They also have universal health care coverage. There are many other important differences that could be important in reducing poverty in these countries. However in almost every case, unions were a major force in advancing the various policies that are associated with lower poverty. It would have been difficult to envision a scenario in which these policies would have been enacted with pressure from unions. The same holds true with measures that have reduced poverty in the United States. The creation and expansion of Social Security, which has lowered the poverty rate among seniors to the same level as the adult population as a whole, would have been impossible without pressure from unions. Similarly programs that help young children, such as Head Start or promote education such as Pell Grants and subsidized student loans, passed with strong support from organized labor. Medicare, Medicaid, and SCHIP have always been strongly supported by unions and the Affordable Care Act would not have passed without a big push from the labor movement. While some wealthy people may support foundations and charities that reduce or ameliorate poverty, the reality is the societies that have been most successful in reducing poverty have done so as a result of the policies pushed by organized workers. Such policies do not get passed into law in countries where workers lack power and charity from the rich does not make up the difference. People who really want to see a reduction in poverty should be applauding efforts to boost the power of unions in the United States. There is one other point worth noting about the poverty comparisons in the graph. The OECD’s measure of poverty is constructed in a way that paints a brighter picture for the United States. A family is considered to be in poverty by this measure if its income is less than half of the median income in the country. (The median is the level of income where half of all families have more income and half have less.) In the United States, because the richest one percent is so far out of line with the rest of the country, the median income level is lower compared to the average than in other countries. This means that half of the median income (the OECD’s cutoff for the poverty level) in the United States would be lower relative to the average income than in other countries. If the OECD constructed a poverty measure that was related to the average level of income, this measure would substantially raise the poverty rate in the United States relative to other countries.